For other uses, see Barnabas (disambiguation). "Barnabus" redirects here. For other uses, see Barnabus (disambiguation). Not to be confused with Barabbas or Barrabas. Barnabas (/ˈbɑːrnəbəs/; Greek: Βαρνάβας), born Joseph, was according to tradition an early Christian, one of the prominent Christian disciples in Jerusalem. According to Acts 4:36, Barnabas was a Cypriot Jew. Named an apostle in Acts 14:14, he and Paul the Apostle undertook missionary journeys together and defended Gentile converts against the Judaizers. They traveled together making more converts (c. 45–47), and participated in the Council of Jerusalem (c. 50) Barnabas and Paul successfully evangelized among the "God-fearing" Gentiles who attended synagogues in various Hellenized cities of Anatolia. His Hellenic Jewish parents called him Joseph (although the Byzantine text-type calls him Ἰωσῆς, Iōsēs, 'Joses', a Greek variant of 'Joseph'), but when recounting the story of how he sold all his goods and gave the money to the apostles in Jerusalem, the Book of Acts says the apostles called him Barnabas. (The "s" at the end is the Greek nominative case ending, and it is not present in the Aramaic form.) The Greek text of the Acts 4:36 explains the name as υἱὸς παρακλήσεως, hyios paraklēseōs, meaning "son of encouragement" or "son of consolation". One theory is that this is from the Aramaic בר נחמה, bar neḥmā, meaning 'son (of) consolation'. Another is that it is related to the Hebrew word nabī (נביא, Aramaic nebī) meaning "prophet". In the Syriac Bible, the phrase "son of consolation" is translated bara dbuya'a. Barnabas curing the sick by Paolo Veronese, Musée des Beaux-Arts de Rouen. Barnabas appears mainly in Acts, a history of the early Christian church. He also appears in several of Paul's epistles. Barnabas, a native of Cyprus and a Levite, is first mentioned in the Acts of the Apostles as a member of the early Christian community in Jerusalem, who sold some land that he owned and gave the proceeds to the community (Acts 4:36-37). When the future Apostle Paul returned to Jerusalem after his conversion, Barnabas introduced him to the apostles (9:27). Easton, in his Bible Dictionary, supposes that they had been fellow students in the school of Gamaliel. The successful preaching of Christianity at Antioch to non-Jews led the church at Jerusalem to send Barnabas there to oversee the movement (Acts 11:20–22). He found the work so extensive and weighty that he went to Tarsus in search of Paul (still referred to as Saul), "an admirable colleague", to assist him. Paul returned with him to Antioch and labored with him for a whole year (Acts 11:25–26). At the end of this period, the two were sent up to Jerusalem (44 AD) with contributions from the church at Antioch for the relief of the poorer Christians in Judea. They returned to Antioch taking John Mark with them, the cousin or nephew of Barnabas. Later, they went to Cyprus and some of the principal cities of Pamphylia, Pisidia, and Lycaonia (Acts 13:14). 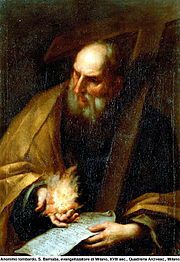 After recounting what the governor of Cyprus Sergius Paulus believed, Acts 13:9 speaks of Barnabas's companion no longer as Saul, but as Paul, his Roman name, and generally refers to the two no longer as "Barnabas and Saul" as heretofore (11:30; 12:25; 13:2, 7), but as "Paul and Barnabas" (13:43, 46, 50; 14:20; 15:2, 22, 35). Only in 14:14 and 15:12-25 does Barnabas again occupy the first place, in the first passage with recollection of 14:12, in the last 2, because Barnabas stood in closer relation to the Jerusalem church than Paul. Paul appears as the more eloquent missionary (13:16; 14:8-9; 19-20), whence the Lystrans regarded him as Hermes and Barnabas as Zeus. The King James Version renders the Greek name "Zeus" by the Latin name "Jupiter" (14:12). Returning from this first missionary journey to Antioch, they were again sent up to Jerusalem to consult with the church there regarding the relation of Gentiles to the church (Acts 15:2; Galatians 2:1). According to Galatians 2:9-10, Barnabas was included with Paul in the agreement made between them, on the one hand, and James, Peter, and John, on the other, that the two former should in the future preach to the pagans, not forgetting the poor at Jerusalem. This matter having been settled, they returned again to Antioch, bringing the agreement of the council that Gentiles were to be admitted into the church without having to adopt Jewish practices. After they had returned to Antioch from the Jerusalem council, they spent some time there (15:35). Peter came and associated freely there with the Gentiles, eating with them, until criticized for this by some disciples of James, as against Mosaic law. Upon their remonstrances, Peter yielded apparently through fear of displeasing them, and refused to eat any longer with the Gentiles. Barnabas followed his example. Paul considered that they "walked not uprightly according to the truth of the gospel" and upbraided them before the whole church (Galatians 2:11-15). Paul then asked Barnabas to accompany him on another journey (15:36). Barnabas wished to take John Mark along, but Paul did not, as he had left them on the earlier journey (15:37-38). The dispute ended by Paul and Barnabas taking separate routes. Paul took Silas as his companion, and journeyed through Syria and Cilicia; while Barnabas took John Mark to visit Cyprus (15:36-41). John Francis Fenlon suggests that Paul may have been somewhat influenced by the attitude recently taken by Barnabas, which might have proven prejudicial to their work. Barnabas is not mentioned again in the Acts of the Apostles. However, Gal. 2:11-13 says, "And when Kephas came to Antioch, I opposed him to his face because he clearly was wrong. For, until some people came from James, he used to eat with the Gentiles; but when they came, he began to draw back and separated himself, because he was afraid of the circumcised. And the rest of the Jews (also) acted hypocritically along with him, with the result that even Barnabas was carried away by their hypocrisy." Barnabas is also mentioned in the First Epistle to the Corinthians, in which it is mentioned that he and Paul funded their missions by working side jobs and (it is implied) went without wives and other benefits other apostles received (1 Cor. 9:6); Paul states that he and Barnabas forsook those benefits "that we may cause no hindrance to the Good News of Christ" (1 Cor. 9:12). Antioch, the third-most important city of the Roman Empire, then the capital city of Syria province, today Antakya, Turkey, was where Christians were first called thus. Some of those who had been scattered by the persecution that arose because of Stephen went to Antioch, which became the site of an early Christian community. A considerable minority of the Antioch church of Barnabas's time belonged to the merchant class, and they provided support to the poorer Jerusalem church. Barnabas participated in the Council of Jerusalem, which dealt with the admission of Gentiles into the Christian community, a crucial problem in early Christianity. Paul and Barnabas proposed that Gentiles be allowed into the community without being circumcised. Church tradition developed outside of the canon of the New Testament describes the martyrdom of many saints, including the legend of the martyrdom of Barnabas. It relates that certain Jews coming to Syria and Salamis, where Barnabas was then preaching the gospel, being highly exasperated at his extraordinary success, fell upon him as he was disputing in the synagogue, dragged him out, and, after the most inhumane tortures, stoned him to death. His kinsman, John Mark, who was a spectator of this barbarous action, privately interred his body. Although it is believed he was martyred by being stoned, the apocryphal Acts of Barnabas states that he was bound with a rope by the neck, and then being dragged only to the site where he would be burned to death. This is highly unlikely since the apocryphal Acts states that his bones were burnt to dust and that relics of some of his bones are stored in a church today; on the other hand, the fire in the apocryphal Acts could have cremated only some of his bones. According to the History of the Cyprus Church, in 478 Barnabas appeared in a dream to the Archbishop of Constantia (Salamis, Cyprus) Anthemios and revealed to him the place of his sepulchre beneath a carob-tree. The following day Anthemios found the tomb and inside it the remains of Barnabas with a manuscript of Matthew's Gospel on his breast. Anthemios presented the Gospel to Emperor Zeno at Constantinople and received from him the privileges of the Greek Orthodox Church of Cyprus, that is, the purple cloak which the Greek Archbishop of Cyprus wears at festivals of the church, the imperial sceptre and the red ink with which he affixes his signature. Anthemios then placed the venerable remains of Barnabas in a church which he founded near the tomb. Excavations near the site of a present-day church and monastery, have revealed an early church with two empty tombs, believed to be that of St. Barnabas and Anthemios. St. Barnabas is venerated as the Patron Saint of Cyprus. Although many assume that the biblical Mark the Cousin of Barnabas (Colossians 4:10) is the same as John Mark (Acts 12:12, 25; 13:5, 13; 15: 37) and Mark the Evangelist, the traditionally believed author of the Gospel of Mark, according to Hippolytus of Rome, the three "Marks are distinct persons. They were all members of the Seventy Apostles of Christ, including Barnabas himself. There are two people named Barnabas among Hippolytus' list of Seventy Disciples, one (#13) became the bishop of Milan, the other (#25) the bishop of Heraclea. Most likely one of these two is the biblical Barnabas; the first one is more likely, because the numbering by Hippolytus seems to indicate a level of significance. Clement of Alexandria (Stromata, ii, 20) also makes Barnabas one of the Seventy Disciples that are mentioned in the Gospel of Luke 10:1ff. Other sources bring Barnabas to Rome and Alexandria. In the "Clementine Recognitions" (i, 7) he is depicted as preaching in Rome even during Christ's lifetime. Not older than the 3rd century is the tradition of the later activity and martyrdom of Barnabas in Cyprus, where his remains are said to have been discovered under the Emperor Zeno. The question whether Barnabas was an apostle was often discussed during the Middle Ages. Tertullian and other Western writers regard Barnabas as the author of the Letter to the Hebrews. This may have been the Roman tradition—which Tertullian usually follows—and in Rome the epistle may have had its first readers. Modern biblical scholarship considers its authorship unknown, though Barnabas amongst others has been proposed as potential authors. He is also traditionally associated with the Epistle of Barnabas, although some modern scholars think it more likely that the epistle was written in Alexandria in the 130s. John Dominic Crossan quotes Koester as stating that New Testament writings are used "neither explicitly nor tacitly" in the Epistle of Barnabas and that this "would argue for an early date, perhaps even before the end of the first century AD." Crossan continues (The Cross that Spoke, p. 121): Richardson and Shukster have also argued for a first-century date. Among several arguments they point to the detail of "a little king, who shall subdue three of the kings under one" and "a little crescent horn, and that it subdued under one three of the great horns" in Barnabas 4:4-5. They propose a composition "date during or immediately after the reign of Nerva (96-8 AD.) . . . viewed as bringing to an end the glorious Flavian dynasty of Vespasian, Titus, and Domitian . . . when a powerful, distinguished, and successful dynasty was brought low, humiliated by an assassin's knife" (33, 40). In 16:3-4, the Epistle of Barnabas says: "Furthermore he says again, 'Lo, they who destroyed this temple shall themselves build it.' That is happening now. For owing to the war it was destroyed by the enemy; at present even the servants of the enemy will build it up again." This clearly places Barnabas after the destruction of the temple in 70 AD. But it also places Barnabas before the Bar Kochba revolt in 132 AD, after which there could have been no hope that the Romans would help to rebuild the temple. This shows that the document comes from the period between these two revolts. Jay Curry Treat states on the dating of Barnabas (The Anchor Bible Dictionary, v. 1, pp. 613–614): Since Barnabas 16:3 refers to the destruction of the temple, Barnabas must be written after 70 C.E. It must be written before its first indisputable use in Clement of Alexandria, ca. 190. Since 16:4 expects the temple to be rebuilt, it was most likely written before Hadrian built a Roman temple on the site ca. 135. Attempts to use 4:4-5 and 16:1-5 to specify the time of origin more exactly have not won wide agreement. It is important to remember that traditions of varying ages have been incorporated into this work. Treat comments on the provenance of the Epistle of Barnabas (op. cit., p. 613): Barnabas does not give enough indications to permit confident identification of either the teacher's location or the location to which he writes. His thought, hermeneutical methods, and style have many parallels throughout the known Jewish and Christian worlds. Most scholars have located the work's origin in the area of Alexandria, on the grounds that it has many affinities with Alexandrian Jewish and Christian thought and because its first witnesses are Alexandrian. Recently, Prigent (Prigent and Kraft 1971: 20-24), Wengst (1971: 114-18), and Scorza Barcellona (1975: 62-65) have suggested other origins based on affinities in Palestine, Syria, and Asia Minor. The place of origin must remain an open question, although the Gk-speaking E. Mediterranean appears most probable. Concerning the relationship between Barnabas and the New Testament, Treat writes (op. cit., p. 614): Although Barnabas 4:14 appears to quote Matt 22:14, it must remain an open question whether the Barnabas circle knew written gospels. Based on Koester's analysis (1957: 125-27, 157), it appears more likely that Barnabas stood in the living oral tradition used by the written gospels. For example, the reference to gall and vinegar in Barnabas 7:3, 5 seems to preserve an early stage of tradition that influenced the formation of the passion narratives in the Gospel of Peter and the synoptic gospels. The 5th century Decretum Gelasianum includes a Gospel of Barnabas amongst works condemned as apocryphal; but no certain text or quotation from this work has been identified. Another book using that same title, the Gospel of Barnabas, survives in two post-medieval manuscripts in Italian and Spanish. Contrary to the canonical Christian Gospels, and in accordance with the Islamic view of Jesus, this later Gospel of Barnabas states that Jesus was not the son of God, but a prophet and messenger. The Catholic religious order officially known as "Clerics Regular of St. Paul" (Clerici Regulares Sancti Pauli), founded in the 16th Century, was in 1538 given the grand old Monastery of Saint Barnabas by the city wall of Milan. This being their main seat, the Order was thenceforth known by the popular name of Barnabites. ^ David H. Stern (1992). Jewish New Testament Commentary. pp. 235–6. ISBN 978-9653590113. ^ "Barnabas". BibleHub. Gives Thayer's Greek Lexicon and Strong's Exhaustive Concordance of the Bible. ^ "CATHOLIC ENCYCLOPEDIA: Antioch". www.newadvent.org. ^ "The Life of our Blessed Lord and Savior Jesus Christ: And the Lives and Sufferings of His Holy Evangelists and Apostles," p.455, 1857 AD, Miller, Orton & Co., 25 Park Row, New York. ^ Compare C. J. Hefele, Das Sendschreiben des Apostels Barnabas, Tübingen, 1840; Otto Braunsberger, "Der Apostel Barnabas," Mainz, 1876. ^ Mitchell, Alan C. Hebrews (Liturgical Press, 2007) p. 6. ^ Compare T. Zahn, Geschichte des neutestamentlichen Kanons, ii, 292, Leipsig, 1890. Herbermann, Charles, ed. (1913). "Epistle of Barnabas" . Catholic Encyclopedia. New York: Robert Appleton Company. Chisholm, Hugh, ed. (1911). "Barnabas" . Encyclopædia Britannica (11th ed.). Cambridge University Press. St. Barnabas at the Christian Iconography web site.